In close proximity to Duke and Durham, the Forest is an oasis for outdoor recreation on the doorstep of an urban environment. However, as use of the Forest has increased some unintended, negative consequences have become more prevalent. 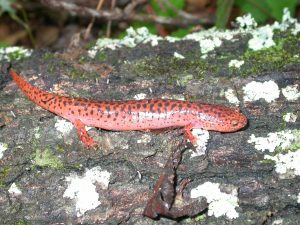 The Red Salamander (Pseudotriton ruber) is a “noteworthy” species found in the Rhododendron Bluff area. Photo courtesy of Jeffrey S. Pippen. 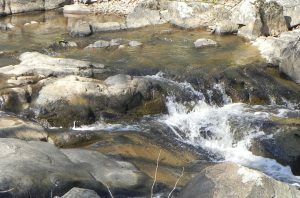 The most popular destination in the Duke Forest is the trail system along New Hope Creek in the Korstian Division. Many of these trails fall within a Significant Natural Heritage Area (SNHA) because of the unique animals and diverse plant communities that it contains. Identified by the NC Natural Heritage Program, the area is one of twelve SNHAs in the Duke Forest that are set aside from harvesting and regularly monitored to ensure their protection. Unfortunately, the combination of heavy foot traffic, off-trail use, and a lack of proper signage has led to severe erosion and ecological disturbance in several areas within the New Hope Creek SNHA. 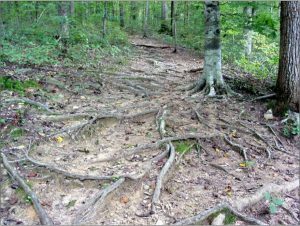 Most users share the familiar experience of staring down at their feet rather than taking in the sights and sounds of the creek to avoid tripping over exposed tree roots. It is also not uncommon to find soil and sediment chutes leading directly into the creek. These problems are compounded by the fact that none of the trails were intentionally developed and designed to withstand long-term use. 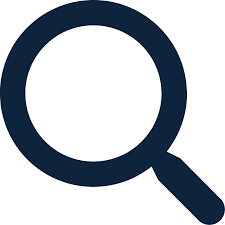 Given these conditions, the trails are extremely difficult to maintain, and they will continue to degrade – resulting in more negative impacts to the ecosystem and increasing hazards for users. 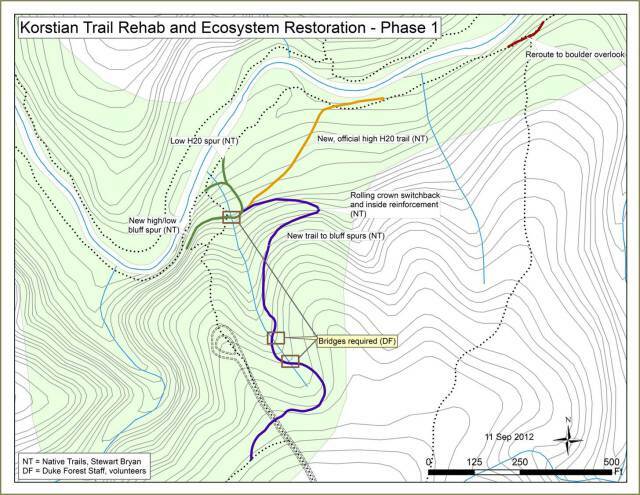 To address these issues, the Duke Forest will implement a trail rehabilitation and ecosystem restoration project along the south banks of the New Hope Creek trail system – a high priority area because of the Rhododendron Bluffs. A degraded trail along New Hope Creek. The degree of root exposure and soil compaction shown here is not uncommon. A flowering Catawba Rhododendron (Rhododendron catawbiense) along New Hope Creek. Planning for this project has been an extensive and thorough process. Since March of 2012, the Duke Forest has engaged local forest users and natural resource experts to discuss the project, its design, and its implications for both the environment and for recreation. 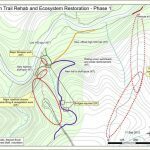 It has also worked closely with Stewart Bryan of Native Trails, Inc., a local trail contractor who has been instrumental in creating the design and who will be responsible for much of the on-the-ground work. Through these collaborative efforts, the Duke Forest has finalized a plan that it hopes will provide long lasting, effective protection of the area’s natural resources while enhancing the recreational user’s experience. 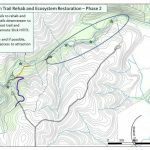 The first phase of the project will focus on the Rhododendron Bluff area, and Phase 2 will extend further downstream toward the Slick Hill Foot Trail. The work is scheduled to begin in January 2013. Unsafe and eroded trails will be closed to create new, official trails that traverse a greater mix of forest types; other trails will be rehabilitated or rerouted – all will continue to provide access to New Hope Creek and the popular bluff rocks that overlook it. Signage to announce the project will be posted soon, and new trail blazes and other educational information will be installed as the project unfolds. Users can support this effort to protect the environment and improve their trail experience by following all posted signs, staying on authorized trails, and keeping dogs on a leash. Trail signs posted to announce the upcoming project to Forest users. The map below shows the project area inside Duke Forest Gate 26 along the south banks of New Hope Creek. 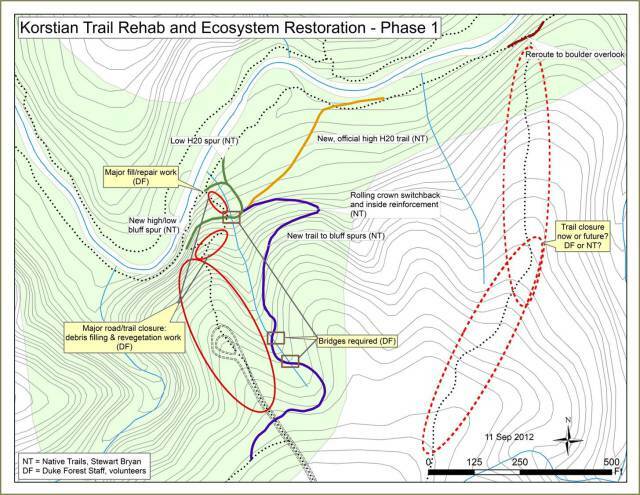 Trails highlighted in yellow will be closed, rerouted, or rehabilitated. 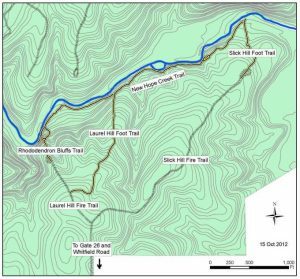 A portion of the Laurel Hill Fire Trail will be abandoned and re-vegetated. 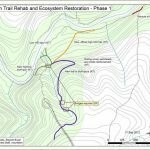 Phase 1 of the project will focus on the area between and including the Rhododendron Bluffs Trail and the Laurel Hill Foot Trail. Phase 2 will continue downstream along the New Hope Creek Trail to the Slick Hill Foot Trail. 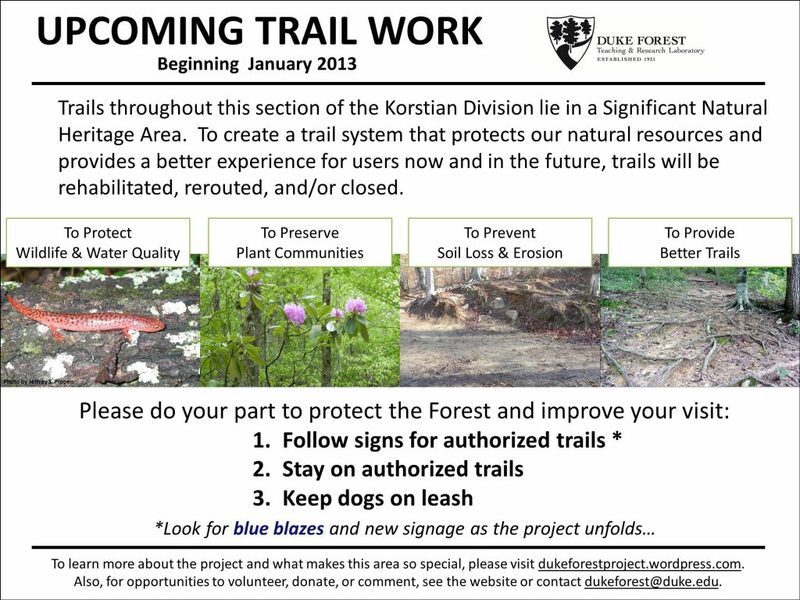 Phase 1 of the Korstian Trails Project will begin in January 2013. The design for Phase 1, which includes the area around the Rhododendron Bluffs, can be seen above. 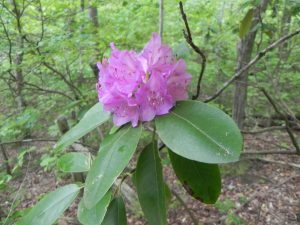 – The purple route will be part of the new access to the Rhododendron Bluffs. The trail will meander through beautiful forest cover and lead to an intersection with options for continuing on to the bluff rocks or heading downstream along the creek. – The orange route represents a formalization and improvement of a currently unauthorized trail that provides a high water route around the creek. -The green lines provide spur trails to the Rhododendron Bluffs and rocks overlooking the creek, as well as access to the creek-side trails. Red circles represent areas that will be abandoned and restored to better protect our natural resources and allow for rehabilitation and restoration of degraded areas. Closures will not occur until the newly developed routes are in place. 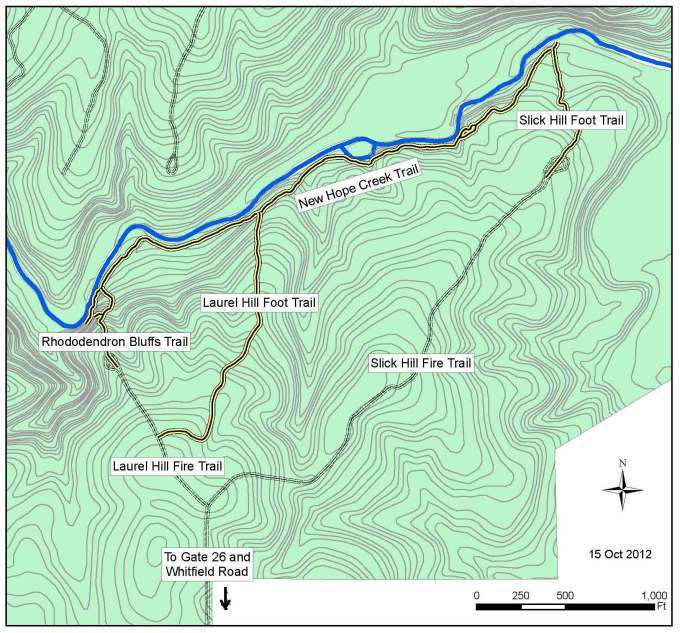 The Project Overview Map shows the names of trails and Forest roads. The area targeted for Phase 2 is shown above in the blue circle. 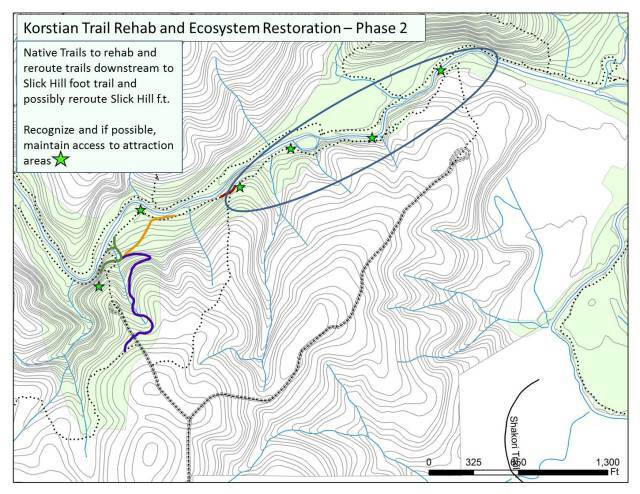 The goal for Phase 2 is to rehab and reroute trails downstream to the Slick Hill Foot Trail and possibly reroute the Slick Hill trail itself. Green stars represent attraction areas, e.g. views of New Hope Creek and rock outcrops; access to these will likely be maintained or improved with the new trail design. Click here for a PDF map with more details about the scope of work: Phase II Design.